Barnes & Noble Crocker Park announced the launch of the 2019 “Barnes & Noble My Favorite Teacher Contest,” which provides high school students with the opportunity to share their appreciation for their teachers with their local communities. Now in its ninth year, the contest launched on Valentine’s Day to give students the opportunity to show love and appreciation to their teachers. High school students can nominate K-12 teachers starting today, Valentine’s Day, through March 14, 2019, by writing essays, poems or thank-you letters detailing how much their teachers have impacted their lives and why they appreciate them. * Entries will be collected online only at www.bn.com/myfavoriteteacher, and will be judged on the compelling nature of the teacher’s inspiring qualities, the sincerity of the student’s appreciation and the quality of expression and writing. Only high school students 14 or older at the time of entry and active teachers employed by elementary, middle or high schools in the United States are eligible to win. The “Barnes & Noble National Teacher of the Year” will receive $5,000, and their school will receive an additional $5,000. The award recipient will also be recognized at a special community celebration at their local Barnes & Noble store. The student who writes the national winning essay, poem or thank-you letter will win a $100 Barnes & Noble Gift Card. If you ever feel daunted by the challenge of climate change, University of California air pollution scientist Shahir Masri and educator Athina Simolaris can relate. But the two young Californians have decided to overcome feelings of powerlessness by pausing their careers this summer to take to the road to advocate for climate action, promote green energy, and identify effective strategies of climate communication. I have a mission for our city council, and it's simple: It’s time for Lakewood to care about all of its citizens. This mission is why I am running for Lakewood City Council At-Large this November. This role is not just a title to me, it’s how I want to give my life back to the city I love. Over the last few years, I’ve realized Lakewood, the city where I chose to build my family, needed an upgrade, and needed to start giving back to the citizens and businesses that make this city great. I am excited to help build on the strong roots our community already has. Lakewood is great community and I’m proud to call it home, but I know we can make it even better, together. When I get elected to City Council, it won’t be a stepping stone — it will be a calling. Two years ago, I ran for judge on the premise of helping people, businesses, animals, and the entire city of Lakewood, and my passion to do just that has only grown. I will be the voice of the disheartened, disenfranchised, and forgotten — seniors, veterans, and youth alike. Our community must get better if we’re going to survive — and thrive — in the tough times ahead. 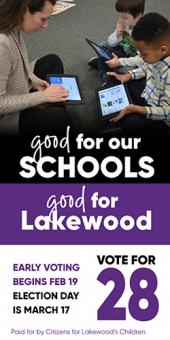 When I am elected, I will improve Lakewood for citizens, visitors, and businesses alike. To see the issues I'm passionate about visit taubmanforlakewood.com. Lakewood High Class of 1971 is having their 45th Reunion the weekend of June 10th and 11th. Friday, June 10th there will be a gathering at VOSH in Lakewood at 1414 Riverside Drive. Vosh is located across from the Bee Clean Car Wash. The event starts at 6 p.m. and runs until ???. There is a cash bar, food is available and the event is FREE. Registration is now open for the 4th Annual Commissioners Youth Scholarship Softball Tournament. All games will be played in a flight format at Foxx and Usher fields. Teams are guaranteed three games; top four teams make the playoffs. Registration fees are $250 per team with early bird registration of $200 through June 15. Fees include umpires, scorers & game balls. Men’s tournament will be Saturday, August 8, with the Co-Ed tournament on Sunday, August 9. Rain dates will be August 15 & 16. Meet Andy, he is one of many residents of Lakewood that require the use of safe sidewalks during the winter. Andy was dodging busy traffic while riding his electronic wheelchair on Detoit Ave when I met him. He said he is forced to dangerously drive in the street, because it is impossible to use the sidewalks in many parts of the city. 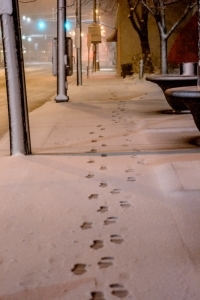 The city has an ordinance requiring business owners to clear their sidewalks, but they are not obeying it. This ordinance is not being enforced by city officials as well as it should be. On January 14th, after having a nice lunch at a restaurant, and a visit with another retired band director, Dad (Robert Rice) and I came home, and I sent him upstairs for his afternoon nap. He appeared to be doing quite well at that point, but he passed away very suddenly, before even getting into bed. Dad would want you all to remember him for his smile and encouragement to others, for his music, (he actually played his trumpet on the morning of his passing) and for his great love for all of you, and for Lakewood. With my help, Dad wrote band marches for Lakewood's schools, as well as a band march for America's veterans. He was a Lakewood Schools music educator from 1958-1983, and a member of the Lakewood Schools Staff Hall of Fame. Dad was 94 years young. Arrangements are private. No visitations or memorials are scheduled. I know that Dad would only wish that each of you smile and reach out and help each other, all the days of your lives. The Lakewood Dog Park is in its 11th year of bringing joy to our town's canines and their owners. You can help out the dog park by participating in the following events. Spiritual, but haven’t found a place to connect? The Lakewood Observer's very own City Council reporter, Christopher Bindel, along with his wife Kristen, welcomed their first child, Lorelei Mae, on March 4, 2014 at 1:55 p.m. She was 8 lbs 1 oz and 20 inches long. The couple, both LHS graduates and civically active community members, are excited to be starting their family here in Lakewood. Hospice Volunteer Education, Wednesdays and Fridays, February 12, 14, 19, and 21, from 8:30 a.m. to 12:30 p.m. at Hospice of the Western Reserve, 300 East 185th St., Cleveland, OH 44119. Anyone 13 years of age or older interested in making a difference in the lives of others is welcome to attend this training. Volunteers interested in working with patients attend all sessions, while volunteering in non-patient areas and teen volunteering requires only attendance at the first class. RSVP required. Call 800-707-8922 (6881) to register. Classes are also offered at other times, days, and locations throughout the year. AARP TAX-AIDE brings you free electronic filing of your tax returns. THE IRS-certified volunteers are ready to help income taxpayers of all ages. You do not need to be an AARP member to receive this service. A photo I.D. and Social Security number are required at time of visit. Bring last year's tax return with you if possible. AARP TAX-AIDE help is available Monday and Tuesday, Noon to 3:30 p.m. starting February 4th at the Lakewood Senior Center West, 16024 Madison Avenue. Entrance with handicap ramp and stairs located on the Northland side of the building. No appointment necessary. Walk in's welcome. I’m Ryan Giermann, a senior at Lakewood High School. I have one last requirement needed to achieve the rank of Eagle Scout: a project to help out my fellow community members. I noticed that the Lakewood Dog Park is a great asset to our city, visited by many people not only from Lakewood, but various neighboring communities as well. Voters in all of Cuyahoga County’s municipalities will cast ballots for President, U.S. Senate and Members of Congress, Ohio Senate and the Ohio House of Representatives, County Prosecutor and County Council members, judicial candidates, State Board of Education seats, the Brook Park Charter Review Commission, as well as local and state issues. Vote by Mail and Early Voting at the Cuyahoga County Board of Elections for the March 6th Primary Election is open as of January 31st. The Board of Elections will begin mailing ballots to voters who have submitted Vote by Mail ballot applications and voters will be able to begin voting early at the Board of Elections. The Board of Elections will not automatically mail ballot applications to voters for this election. Voters must request a ballot application if they wish to vote by mail. AARP tax-aide brings you free electronic filing of your tax returns. The IRS-certified volunteers are ready to help low and moderate income taxpayers of all ages. You do not need to be an AARP member to receive this service. AARP tax-aide help is available Monday and Tuesday, noon to 4 p.m. at the Lakewood Senior Center, West 16024 Madison Ave. Call 216-226-0611 to set up an appointment after January 5, 2012. AARP tax-aide help is also available at the Barton Center, 14300 Detroit Ave., Thursdays 9:00 am til noon. 216-221-3400, and Lakewood Public Library, Madison branch, 13229 Madison Ave. Tuesdays noon to 4:00 pm., 216-228-7428. The Health Improvement Partnership – Cuyahoga (HIP-Cuyahoga) is a group of community organizations working together to improve the health of all those who live, work, learn and play in Cuyahoga County. We are conducting a survey to get your opinions about health and quality of life and to help identify our community’s strengths, as well as issues needing more attention. Anyone who “lives, works, learns and plays” in Cuyahoga County is considered a part of our “entire community” and is encouraged to respond to this anonymous survey. There’s no better way to start out the season than with a little community service, and H2O has a huge project for everyone to participate! This summer H2O, Help to Others, is holding its annual “Clothes 4 Kids” clothing drive as a service project for its summer service camp. The project is planned by H2O, which is a program within the City of Lakewood’s Division of Youth, in partnership with the Division of Fire, Lakewood City Schools and Lakewood Hospital. Gently used clothing and school supply donations are collected from donation spots by camp staff several times a week and are then brought to the site of service camp at Lakewood High School. The next step in the process is that the middle school campers sort and price all clothing items, and they clean, repair and organize used school supplies to be packaged and distributed through Lakewood Community Services Center before school begins in late summer. Save the date of Saturday, September 11, from 11 a.m. to 5 p.m. for the 23rd annual Lakewood Community Festival held at Madison Park. The festival celebrates community, cultural heritage, and families. The Flag Raising Ceremony is held at 11 a.m. by various military organizations and the Lakewood High School Ranger Marching Band. Many local churches and businesses will be providing ethnic foods and baked goods for purchase. Free musical entertainment consists of a wide selection of bands. Other special features include: pony rides and alpacas; balloon man and bubble man; Lake Erie Nature Center and children's games; and rides available on the Euclid Beach Rocket Car. All participating booths are encouraged to hold crafts and games, as well as, information and product sales of the business or organization. The last outdoor movie of the summer put on by the City of Lakewood will be held at Madison Park, 13029 Madison Ave this Friday, August 13. Bring your blankets and lawn chairs and join us on the baseball field for this free movie. The movie begins at dusk or around 9:30 p.m. Friends of Madison Park will be selling snacks and beverages. “Cloudy with a Chance of Meatballs” is rated PG. This fun animated film is about a young inventor with a dream of inventing something that will improve everyone’s life. Just when he thinks he’s finally made it, things get very messy! In the event of rain, the movie will be shown in the Lakewood City Hall Auditorium, 12650 Detroit Avenue, at 8:00 PM. To find out if movie has been moved indoors, please call (216) 529-6650 after 5:00 PM on the movie night or tune into Lakewood Radio 1660 AM. The West Cleveland Patriots, a non-partisan, non-profit organization, has scheduled an open forum debate for the candidates of the new Cuyahoga County Council District 2 which includes Lakewood, Cleveland Wards 18 & 19 (West Park) and Brook Park. This debate will take place at the Lakewood Public Library Main Branch at 15425 Detroit Ave on Sunday August 15, 2010 starting at 5:30PM. All candidates will be invited and have equal time to speak on the topics. The candidates for District 2 are: Tom Jordan (D) / Dale Miller (D) / Stephanie Morales (I) / John Zappala (R). This event is free and open to the public. Please come meet your candidates for the new County Council. The primary election for this race will be Tuesday September 7, 2010. Lakewood Christian Service Center (LCSC) has an opening for a part-time office administrator. LCSC is looking for an experienced, energetic individual who embraces our mission. The successful candidate will work as a team player and represent LCSC professionally. A total of 715,995 Vote by mail applications will soon be arriving in mailboxes for the May 4, 2010 Primary Election. The Cuyahoga County Board of Elections will begin mailing applications on March 16, 2010. Voter interest in the May 4, 2010 Primary Election is expected to be high. Voters will cast ballots for US Senate, US House of Representatives, state offices, including Governor, and Judicial Candidates. Voters will select Democratic, Republican, Libertarian, and Green Party State Central Committee Members, and Democratic, Libertarian, and Green Party voters will choose their County Central Committee Members. There are also 49 local, county, and state issues on the ballot and 1,293 candidates running for election in Cuyahoga County. As part of the American Heart Association's "Go Red For Women" campaign, the Lakewood "Open Your Heart Committee" is sponsoring a fundraiser entitled: "DRESS UP YOUR HEART" to help raise awareness of the #1 killer of women in the U.S.- Heart Disease. The Event will take place on Saturday, February 6, 2010 from 12:00 PM to 2:00 PM at the Lakewood Presbyterian Church Hall at 14502 Detroit Ave. in Lakewood. As part of Lakewood's Park Donation Program named Dana's Legacy, a tree has been donated in the name of Abby Johnson. Join Abby's friends and family for the tree dedication to be held Saturday, November 14, 2 p.m. at Lakewood Park. The Lakewood Chapter of the League of Women Voters Cuyahoga Area has organized a Candidate Forum featuring Lakewood Council At Large candidates who will be on the Nov. 3 election ballot. Open to the public to be held Thursday, October 22, starting at 7:00 pm, at the Lakewood Public Library, 15425 Detroit Road. The format includes a brief statement by each candidate, followed by a question and answer session with written questions from the audience. For more information, please call the League office at 216 781-0555 or visit www.LWVCuyahogaArea.org. The Phoenix Project will be holding a benefit in support of the Lakewood Animal Shelter on Saturday November 14th at the Phoenix Project church at 13351 Madison Avenue. There will be a blessing of the pets at 3:00 pm, a dog walk (5:00 pm) and then live music at 7 pm. All pets are welcome. For more info, please call Rev. Meredith, 216-906-3026. Buy a raffle ticket for a chance to win 14 lower-level suite tickets to a Cavaliers game at Quicken Loans Arena on a mutually agreeable date in the 2009-2010 Cavs season. The winning ticket holder also receives four parking passes. WHAT: First proclaimed by former President Ronald Reagan in 1983 as National Missing Children’s Day, May 25th serves as an annual reminder to the nation to renew efforts to reunite missing children with their families, remember those who are still missing and make child protection a national priority. Ryan Sweeney, 2004 LHS graduate, has achieved a Bachelor of Arts and Sciences degree majoring in English at the University of Akron. Ryan is a published writer; having written articles for magazines dealing in the fields of trenchless industry and compact machinery. Ryan will explore a career in publishing. ADVERTISEMENT FOR - "Let's Wine About Winter"
See attached flier for advertisement. Indulge in cutting edge, upscale salon services in a relaxed atmosphere at Solstice Salon, now celebrating its fall grand opening. Located on the hip strip at Madison Avenue in Lakewood, customers can treat themselves to boutique services at reasonable prices. Specialties include designer haircuts, multi-dimensional color and corrective hair color treatments. Solstice services men, women and children. Versatile stylists manage all hair types, including multicultural cuts. Did you miss the West End Halloween Painting Contest or want more info? Go to our website: www.lakewoodchamber.org and you can find out who the winners were and view some great pictures of the event. Times are tough, but “ART GETS GRITTY IN THE CITY “ Remaining upbeat, a group of artists is pushing onward with their show scheduled for November 16, Sunday, 2-6pm, former Lakewood Screw Factory, S. W. entrance off Bramley, 2nd floor, Nagel Studio..
Nine Princess Warriors are going to Vegas! They won their league. They won the State Championship. They won the regional qualifier against Michigan, Indiana & Wisconsin and now they are going to Vegas, Baby, for the Unisted States Tennis Association Nation Championship! Be a part of a sport that has won more Olympic medals than any other winter sport. Lakewood's Vernon Bogner Celebrates His 95th Birthday! Tom Bullock, Lakewood City Council Member for Ward II, is taking time to meet and hear young families on what makes Lakewood the place of choice to raise children. Tuesday, June 3rd, he will be at Malley’s 14822 Madison Ave., between 6:30 pm and 8:30 pm as an informal way to hear what young families have to say and give insight into where Lakewood should be heading! At the same time, this is a perfect outing for the family!.. Matthew and Kathleen Markling are proud to announce the arrival of Lakewood's newest resident. Ian Matthew Markling was born on April 8, 2008, at 5:39 p.m., weighing in at 8 pounds, 14 ounces and 19.5 inches in length. Declan and Nevan are very excited to have another brother. The Markling Family is proud to call Lakewood Home. The holiday season is coming and the Huntington’s Disease Society of America (HDSA) is selling amaryllis bulbs as gifts for various occasions. This November 11th is a day to appreciate and recognize all of our veterans. Capture the enchanting streetscape as this historic suburb turns back time and Detroit Avenue is illuminated in Light Up Lakewood. Lakewood School Board Candidate Matthew John Markling and Incumbent Candidates Linda G. Beebe and W. Charles Geiger, III Announce Exchange of Endorsements. On Friday, October 26 from 6:00pm - 8:00pm, the Lakewood Family YMCA is hosting a Halloween HullabaBOO Party! Get ready for a day full of excitement, Pumpkin Palooza is just around the corner! Come celebrate Lakewood’s 8th annual Pumpkin Palooza on Sunday, October 29th from 1:00 to 4:00 p.m. at Lakewood High School.